The top bar is located in the top section of the header and gives you the option to display the data, top menu, social icons and log in/join section. Newspaper theme comes with 4 templates to give you the freedom to customize this section to best fit your needs. We designed 5 beautiful layouts for the top bar to offer you multiple options for customizing your site. You can choose what items you want to display and how to order them in this section. Please see below how to customize it. Enable top bar – The theme comes with the Top Bar enabled by default. If you would like to disable it just go to Theme Panel – Header and expand the Top Bar section. Turn off the button in the Enable Top Bar section. 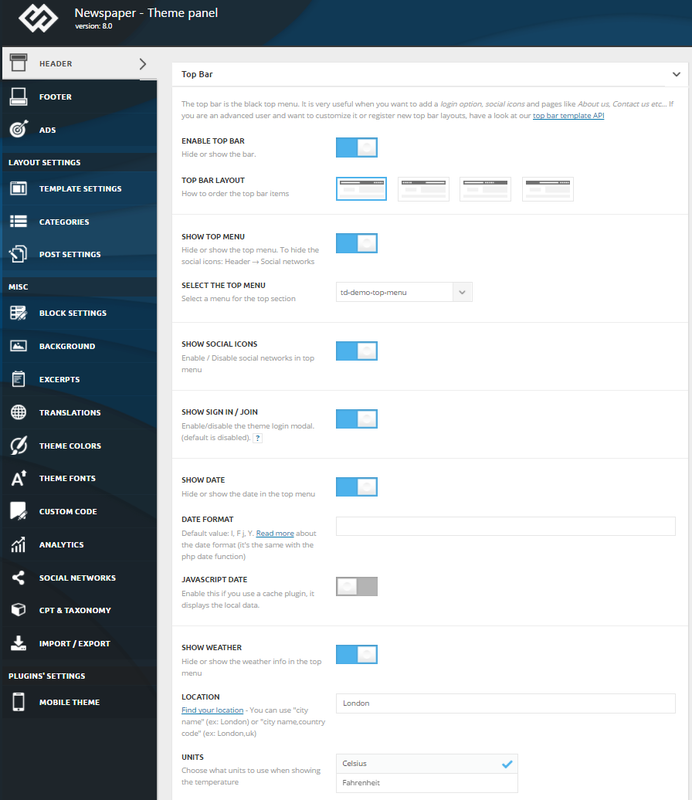 Top Bar Layout – You can decide how to order the top bar items. To do that go to Theme Panel – Header and expand the Top Bar section. Choose one of the four layouts and click on it. Show Top Menu – This option allows you to enable or disable menu in the top bar. To do that go to Theme Panel – Header and expand the Top Bar section. Turn the button on or off to Enable or Disable menu Top Bar section. Select the top menu – You can decide what menu you want to display in the top bar section. Go to Theme Panel – Header and expand the Top Bar section. Select the desired menu from the drop box option. Date format – After you decide to add the date in the top bar, just type the desired format to display it. Show weather – It displays weather info for the selected location. API key – Insert the API key for the top bar widget. After you finished customizing this section click the Save Settings button.